For the remainder of this example we will make use of a running example. Much, but not all, of the source code will be included on this page. 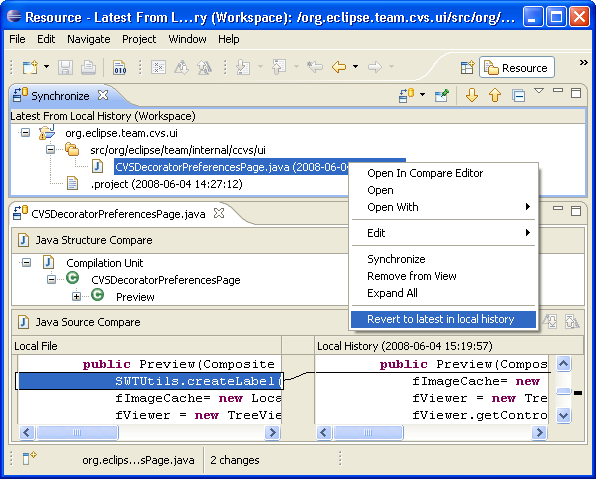 The full source code can be found in the local history package of the org.eclipse.ui.examples.filesystem plug-in. You can check the project out from the Git repository and use it as a reference while you are reading this tutorial. Disclaimer: The source code in the example plug-ins may change over time. To get a copy that matches what is used in this example, you can check out the project using the 3.3.2 version tag (most likely R3_3_2) or a date tag of June 10, 2007.